Mac OS 10.5.2: Changes to Stacks? There is a rumour making the rounds that Apple has made changes to Leopards’s Stacks feature based on criticism from Mac users for its next Mac operating system update, due at the beginning of 2008. It seems that, in addition to the current grid and fan views, Tiger’s hierarchical folders will be making a comeback. As I stated previously I liked the way Apple implemented the Stacks feature. On the other hand more choice never hurt anyone – hopefully this rumour turns out to be true. The reason for this is that Spaces provides another way of handling open applications by bringing virtual desktops to OS X. Virtual desktops have been around a while for the Mac in the form of third-party applications but this is the first time that Apple has included this functionality in the Mac OS. Spaces allows the user to sandbox applications, thereby making it easier to manage them when there are multiple applications open at the same time. 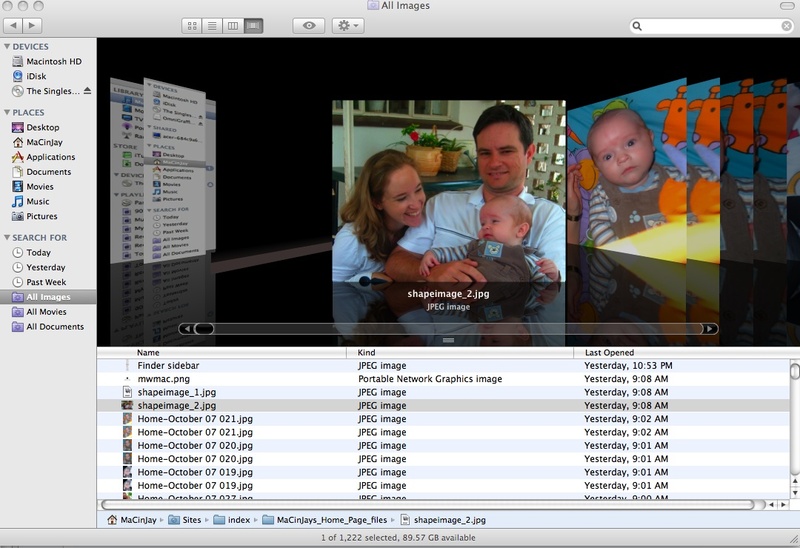 This is achieved by assigning applications to different spaces, as shown in the screen-shot, but it is also possible to allocate an application to work in every space. There are four spaces by default but it is possible to create sixteen in total, although I’m not sure that it would be practical to effectively manage so many (more on that presently). 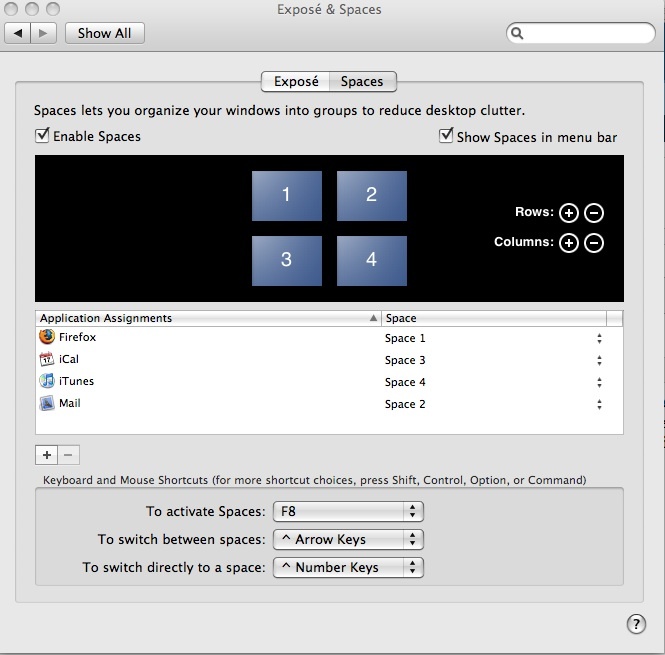 Leopard provides several ways to activate and manage spaces. Firstly there are the keyboard shortcuts, which can be changed in System Preferences as shown above. (Strangely the default settings in System Preferences indicate a combination of SHIFT with arrow and number keys to switch to different spaces but the default on my MacBook Pro is actually the CONTROL key.) Secondly there is an option to access spaces from the menu bar. It is then possible to reassign applications by dragging them between the different spaces. So far I have found Spaces to be an excellent way of managing my work-flow. For example, now when I am surfing the Internet and want to check my email I simply press CONTROL and my right arrow key, then CONTROL and the left arrow key to go back to my browser. I do have a couple of gripes though. First up, switching spaces from the menu bar would be a lot more useful if it was possible to give my spaces a name. I imagine that this would also make it more practical to manage a larger number of them. Secondly it would be nice if applications assigned to specific spaces launched automatically upon switching to that space; sometimes I find myself switching to a space only to find an empty desktop because I forgot to open the application in the first place. Notwithstanding these small criticisms I believe that Apple has scored a hit with Spaces, which will no doubt become even better with future updates.